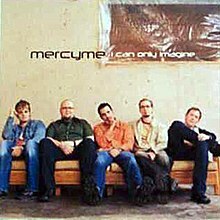 (2002) "Word of God Speak"
(2003) "The Change Inside Of Me"
"Word of God Speak" is a song by Christian rock band MercyMe. Written by Bart Millard and Pete Kipley, "Word of God Speak" uses sparse instrumentation, featuring only piano and strings to accompany Millard's vocals. The lyrics to "Word of God Speak" reflect on the idea that it is impossible to speak of an infinite God with a limited vocabulary. Released as the second single from MercyMe's 2002 album Spoken For, Billboard magazine ranked the song at the top spot on their 2000s decade-end Christian Songs and Hot Christian AC charts. "Word of God Speak" spent 23 weeks atop the Billboard Christian Songs chart, the fifth longest running record for that chart; it spent a total of 76 weeks on that chart altogether. It also topped the Billboard Hot Christian AC chart and the Radio & Records Christian AC and INSPO charts, and peaked at No. 25 on the Christian CHR chart. "Word of God Speak" also won the Dove Awards for Song of the Year and Pop/Contemporary Song of the Year at the 35th GMA Dove Awards. MercyMe's lead singer Bart Millard wrote "Word of God Speak" while touring in support of their single "I Can Only Imagine". The travel was exhausting, and Millard commented in an interview that, on one of the nights on tour, he "went to bed just really frustrated... It started feeling like everything I was saying was the same. I just thought, I have nothing else to say. So I went to bed with that on my mind". After falling asleep, Millard woke up early in the morning and wrote several lines to the song in his journal before going back to sleep. Several weeks later, he was searching through his journal and found the notes again; when he went to the band's studio, he showed the notes to his producer, Pete Kipley. The two finished the lyrics to the song in less than thirty minutes, and recorded the piano track the same night; they also brought in someone to compose a string track for the song. Millard wanted "Word of God Speak" to contain only piano, avoiding the big production that could assure the song success on the radio, as he felt the simple production would mirror the lyrics. "Word of God Speak" was written by Bart Millard and Pete Kipley; it was also produced by Kipley. It was recorded at several locations; Luminous Sound in Dallas, Texas, The Sound Kitchen in Franklin, Tennessee, Indigo Room in Franklin, Tennessee, HydeAway Sound Lab in Jeckyll Island, Georgia, The Scwoodio in Greenville, Texas, Mountain View Recorders in Glorieta, New Mexico, and Playground Recording in Wylie, Texas. It was mastered by Richard Dodd at Vital Recordings, and mixed by Salvo at Salvo Mix. "Word of God Speak" is a contemporary Christian song with a length of three minutes and seven seconds. It is set in the key of C major and has a tempo of 69 beats per minute, with Millard's vocal range spanning from C4-F5. The music to "Word of God Speak" is stripped down, featuring piano and vocals; a string track is also present. The simple production was intended to mirror the lyrics of the song, which reflect on the concept that it is impossible to speak of an infinite God with the limited vocabulary of humanity. A critic, Russ Breimier, also noted the song reminds that "prayer and worship are not flowery orations". On his review of Spoken For, Russ Breimeier commented that "I particularly liked the brief "Word of God Speak," which simply reminds us that prayer and worship aren't about flowery orations... This song is to prayer what "Heart of Worship" is to worship". "Word of God Speak" won the awards for Song of the Year and Pop/Contemporary Song of the Year at the 35th GMA Dove Awards. "Word of God Speak" peaked at number one on the Billboard Christian Songs chart, and spent 23 weeks at the top of the chart, and a total of 76 weeks on the chart. On the Billboard Hot Christian AC chart, the song spent 21 weeks atop the chart, and spent 61 weeks on it in total. On the Radio & Records Christian AC chart, "Word of God Speak" spent 10 weeks at the top, and stayed on the chart for 46 weeks in total; on the Radio & Records INSPO chart, the song spent nine weeks atop the chart, and spent 21 weeks on it in total. Additionally, the song peaked at No. 25 on the Radio & Records Christian CHR chart, and spent 12 weeks on that chart in total. "Word of God Speak" ranked at No. 5 on the 2004 year-end Billboard Hot Christian Singles & Tracks Titles chart, and at No. 9 on the 2004 year-end Billboard Hot Christian Adult Contemporary Titles chart. It ranked at No. 1 on both the 2000s decade-end Christian Songs chart and the 2000s decade-end Hot Christian AC chart. "Word of God Speak" has been covered by several artists. In 2005, actress Kristin Chenoweth covered the song on her album As I Am, and Christian rock band Kutless recorded a version of the song on their 2005 album Strong Tower. In 2004, contemporary Christian band Big Daddy Weave recorded a version of the song that was included on the compilation album WOW Worship: Red. ^ The band members' instruments are not credited on the album's liner notes, aside from Bryson's role in recording. As only piano and strings are present in the song, only Bryson and Millard's de facto roles in the group are credited. ^ a b c d Hambrick, Melissa (June 23, 2004). "Song Story: "Word of God Speak" by MercyMe". Crosswalk.com. Retrieved 19 November 2011. ^ a b (2002) Album notes for Spoken For by MercyMe, pp. 4,7. INO Records. ^ a b "MercyMe - Word of God Speak Sheet Music". Musicnotes.com. Simpleville Music. Retrieved 21 August 2011. ^ a b Breimeier, Russ. "Spoken For, Christian Music Reviews". Christianity Today International. The Fish. pp. 1–2. Retrieved 11 November 2011. ^ Jones, Kim. "35th Annual Dove Awards Recipients". About.com. The New York Times Company. Retrieved 20 November 2011. ^ "Christian Songs (August 16, 2003)". Billboard. Prometheus Global Media. Retrieved 21 August 2011. ^ a b c d e f g h i j "Billboard Charted Singles" (PDF). Mikecurb.com. Curb Records. Retrieved 21 August 2011. ^ Trust, Gary (April 23, 2010). "Ask Billboard: Which Carrie Songs To 'Play'?". Billboard. Prometheus Global Media. Retrieved 12 November 2011. ^ a b "Hot Christian Singles and Tracks Titles Year-end (2004)". Billboard.biz. Billboard. 25 December 2004. Retrieved 14 October 2011. ^ a b "Hot Christian Adult Contemporary Titles Year-end (2004)". Billboard.biz. Billboard. 25 December 2004. Retrieved 14 October 2011. ^ a b "Hot Christian AC Decade-end (2000s)". Billboard.biz. Billboard. 2009. Retrieved 19 November 2011. ^ Loftus, Johnny. "As I Am - Kristin Chenoweth". Allmusic. Rovi Corporation. Retrieved 20 November 2011. ^ Losey, Steve. "Strong Tower - Kutless". Allmusic. Rovi Corporation. Retrieved 20 November 2011. ^ Loftus, Johnny. "WOW Worship: Red". Allmusic. Rovi Corporation. Retrieved 20 November 2011. ^ "Amazon.com "I Can Only Imagine"/"Word of God Speak"". Amazon.com. Retrieved 9 August 2011. ^ "iTunes – Music – Almost There by MercyMe". iTunes Store. Apple Inc. Archived from the original on 31 October 2011. Retrieved 24 October 2011. ^ "iTunes – Music – Spoken For by MercyMe". iTunes Store. Apple Inc. Archived from the original on 31 October 2011. Retrieved 24 October 2011. ^ "ACE Title Search "I Can Only Imagine"". American Society of Composers, Authors and Publishers (ASCAP). Archived from the original on 31 October 2011. Retrieved 27 October 2010. ^ "ACE Title Search "Word of God Speak"". American Society of Composers, Authors and Publishers (ASCAP). Archived from the original on 31 October 2011. Retrieved 27 October 2010. ^ ""Word of God Speak" Sheet Music". Musicnotes, Inc. (Kathleen Marsh). Archived from the original on 31 October 2011. Retrieved 23 October 2011. ^ "MercyMe Chart History (Hot Christian Songs)". Billboard. Retrieved June 11, 2018. ^ "MercyMe - Christian AC History". Billboard. Retrieved June 11, 2018. ^ "Hot Christian Singles and Tracks Titles Year-end (2003)". Billboard.biz. Billboard. 25 December 2004. Retrieved 11 September 2018. "Bless Me Indeed (Jabez's Song)"
"The Change Inside Of Me"
"The Hurt & The Healer"